The Cavalier King Charles Spaniel (affectionately known as a ‘Cav’) is an offshoot of the King Charles Spaniel. The King Charles Spaniel was created by crossing small Spaniels with a short snouted breed such as the Pug or Japanese Chin. It was brought to Scotland from Continental Europe (possibly by Mary, Queen of Scots) in the 1500’s or 1600’s, where it became a fashionable lap dog and companion for the noble class. King Charles Spaniels were also popular lap warmers (and flea magnets) for the lower class. King Charles II, for whom the breed is named, grew up with a pet King Charles Spaniel (then known as the Toy Spaniel), and was such a big fan of the breed that he was accused of neglecting his official duties to spend time with his pet Spaniels. He once issued a decree that the breed could not be forbidden entry to any building, including Parliament! Some King Charles Spaniels, such as the red and white ‘Blenheims’, served as hunting dogs, but most strains were bred for appearance rather than work capacity. Over the years, the breed became smaller with a shorter nose. In the 1920’s, a wealthy American man named Roswell Eldrige traveled to England and offered 25 pounds, a large sum at the time, for an ‘old style’ or ‘pointed nose’ version of the breed, similar to Charles II’s actual dog. The effort was successful, and the Cavalier King Charles Spaniel eventually surpassed its short nosed cousin in popularity, achieving American Kennel Club recognition in 1996. The Cavalier King Charles Spaniel has a shoulder height of 30-33 cm (12-13 in) and weighs 5-8 kg (12-18 lbs). It has a large muzzle, large eyes, and long, highly set ears. Cavalier King Charles Spaniels have a flat back and breed-characteristic feathered feet. Unlike most Spaniels, they have a long, feathered tail which is carried high and moves when the dog runs. The Cavalier King Charles Spaniel has long, soft, silky hair which is lightly waved. There are four color types which were formerly considered separate breeds: tricolor (‘Prince Charles’), red and white (‘Blenheim’), black and tan (‘King Charles’) and red (‘Ruby’). The Cavalier King Charles Spaniel is an average shedder. The Cavalier King Charles Spaniel loves to be with its family and craves attention. It is cheerful, playful, and intelligent—an ideal dog to carry with you and share your time with. Cavalier King Charles Spaniels do not bark frequently. They are generally well behaved, but can sometimes be timid or stubborn. The Cavalier King Charles Spaniel loves to be with its family and craves attention. It is cheerful, playful, and intelligent—an ideal dog to carry with you and share your time with. Cavalier King Charles Spaniels do not bark frequently. They are generally well behaved, but can sometimes be timid or stubborn. The Cavalier King Charles Spaniel gets along well with children (older children are preferable), other dogs, and any household pets. It is friendly, happy, and loving. Cavalier King Charles Spaniels are devoted to loved ones but suspicious around strangers. You can find Cavalier King Charles Spaniel puppies priced from $125 USD to $3850 USD with one of our credible breeders. Browse through our breeder's listings and find your perfect puppy at the perfect price. The Cavalier King Charles Spaniel gets along well with children (older children are preferable), other dogs, and any household pets. It is friendly, happy, and loving. Cavalier King Charles Spaniels are devoted to loved ones but suspicious around strangers. The Cavalier King Charles Spaniel must be brushed several times a week. It should be bathed only when necessary. Cavalier King Charles Spaniels have a life span of 10-12 years. Cavalier King Charles Spaniels are susceptible to mitral valve disease (a heart condition) and syringomyelia (a spinal condition), which afflicts many members of the breed. They may have a soft spot in the skull, which closes by adulthood and is not considered a risk. Fused toes are also not considered a health risk. 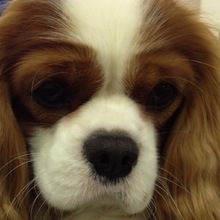 Cavalier King Charles Spaniels may be sensitive to anesthesia and hot weather. The intelligence of the Cavalier King Charles Spaniel makes training fairly easy. This breed requires a gentle approach. The exercise needs of the Cavalier King Charles Spaniel are uncomplicated. It enjoys walks, but its needs can usually be met with indoor play; it will adapt itself to the activity level of your family. The Cavalier King Charles Spaniel is well suited to apartment life. The Cavalier King Charles Spaniel should be leashed or watched closely around roads as it tends to give chase to small animals. Cavalier King Charles Spaniel Puppies for Sale - Shipped Worldwide! Finding the right Cavalier King Charles Spaniel puppy can be dog gone hard work. PuppyFind® provides a convenient and efficient means of selecting and purchasing the perfect Cavalier King Charles Spaniel puppy (or Cavalier King Charles Spaniel puppies) from the comfort of your home, 24 hours a day, 7 days a week. Take advantage of our PuppySearch or leisurely browse our directory of hundreds of dog breeds, Cavalier King Charles Spaniel dog breeders, Cavalier King Charles Spaniel dogs for adoption, and Cavalier King Charles Spaniel puppy for sale listings with photos and detailed descriptions. Some Cavalier King Charles Spaniel puppies for sale may be shipped Worldwide and include crate and veterinarian checkup. Many Cavalier King Charles Spaniel dog breeders with puppies for sale also offer a health guarantee. With thousands of Cavalier King Charles Spaniel puppies for sale and hundreds of Cavalier King Charles Spaniel dog breeders, you're sure to find the perfect Cavalier King Charles Spaniel puppy.